I’m all about simple, classic dessert recipes that everyone loves. 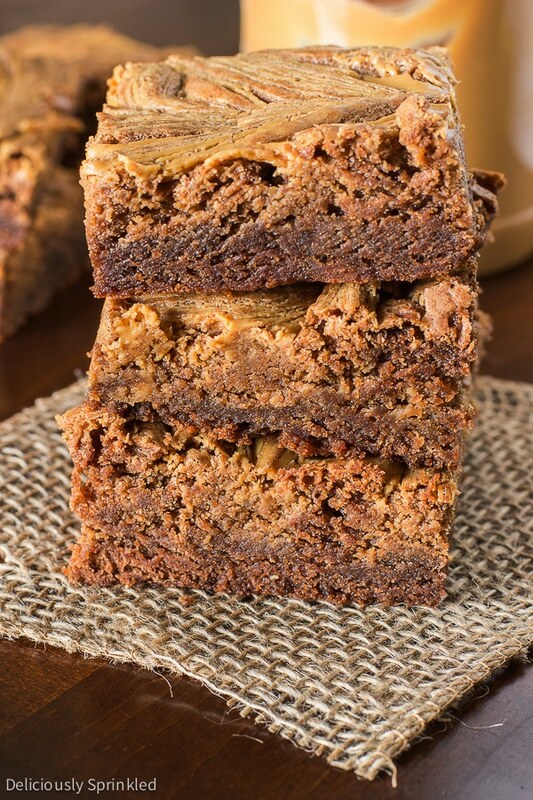 And these Peanut Butter Swirl Brownies are just that….simply delicious! I mean the only thing that can make a brownie better is PEANUT BUTTER. Right!? 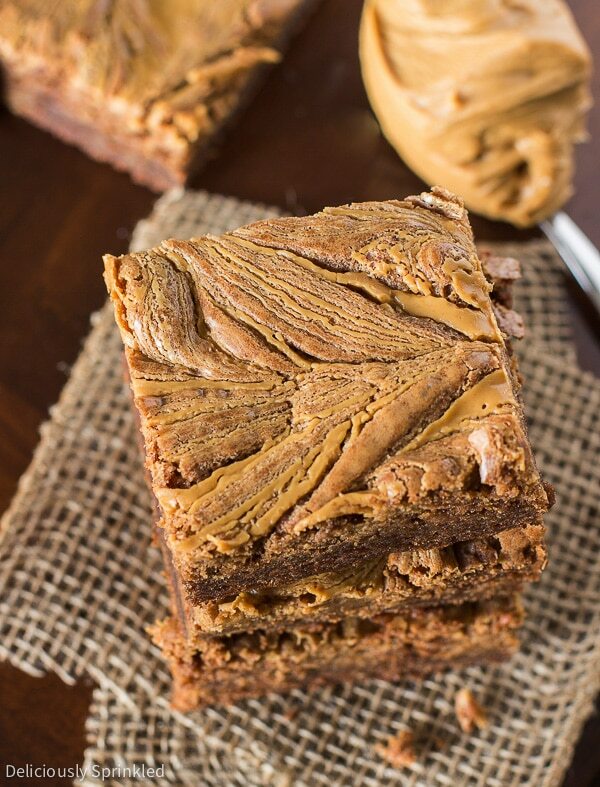 These Peanut Butter Swirl Brownies start out by using my favorite Homemade Fudgy Brownies recipe, I promise these brownies are just as easy to make as a brownie box mix but these brownies taste a million times better. I swirled creamy peanut butter (or you could use chunky peanut butter for an extra crunch) into the brownie batter to make these delicious, family-favorite brownie recipe and I guarantee these Peanut Butter Swirl Brownies will be a family favorite in your house too. ENJOY! ✔ I like to use Milk Chocolate Chips to make these brownies, but you can also use semi-sweet chocolate chips or dark chocolate chips….it just depends on how rich you like your brownies to be. ✔ To make it super easy for you to cut the brownies into squares, line your 9×13 inch baking pan with aluminum foil, leaving enough overhang on the sides and spray the foil with non-stick cooking spray. Once the brownies have cooled, lift the brownies out of the pan, folding down the aluminum foil sides. Then use a sharp knife to cut the brownies into squares. 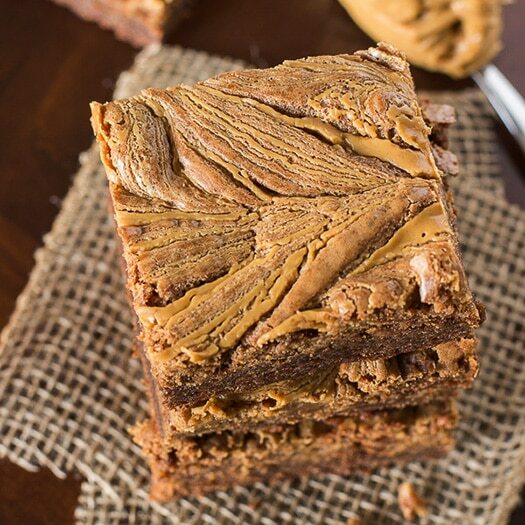 ✔ I used creamy peanut butter to “swirl” on top of these brownies. But you could also use chunky peanut butter if you want to add an extra “crunch” to your brownies. Either way, these brownies will be amazing! PRE-STEP: Preheat oven to 325F degrees. Line a 9x13 inch baking pan with aluminum foil leaving enough overhang on the sides and spray with non-stick cooking spray. Set aside. STEP 1: In a medium sized saucepan, combine sugar, butter, and water. Bring to boil. STEP 2: Remove from heat. Add chocolate chips and vanilla extract; stir until chocolate melts. STEP 3: Pour chocolate mixture into a large mixing bowl. Using an electric or stand mixer, beat in eggs, mixing after each egg. STEP 4: Mix in flour, baking soda, and salt until combined. STEP 5: Pour brownie batter into prepared pan. Melt creamy peanut butter in the microwave for 30 seconds. Spoon melted peanut butter on top of brownie batter. Using a knife to "swirl" the peanut butter into the brownie batter. Bake for 50 minutes or until tooth pick inserted into center comes out clean. STEP 6: Let brownies cool before cutting into squares. *Store brownies in an airtight container at room temperature for up to 1 week. Thank for the spoon tip. What else should i say? Gorgeous. Thank for the spoon tip. It will change my life forever. I’ll take my would-be-mother-in-law by surprise. Wait for my good news! THESE BROWNIES ARE MY LIFE. But, for serious, peanut butter and chocolate swirly goodness? Do you ship!? 😀 Pinned!